WBC11 - Wine Bloggers: Who Are We? One of our responsibilities at the 2011 Wine Bloggers Conference was to video as much of the happenings as possible in association with Virginia Wine TV. Many of you probably saw me (or my assistant Laszlo or Aaron) camera in hand through the Loudoun County pre-tour, the tour of UVA, the seminars, keynote speeches, Other 46, Monticello, the winery tours, and the Ignite sessions. Except for the Siips gathering, the camera was usually put to bed as early as possible in order to accommodate @RichardPF request of no late night footage. Thus nothing from #606 or #235 or the Saturday night dance party. In any case, thanks to all the attendees who participated on camera and I'm looking forward to continuing our discussions online and seeing everyone at WBC12 in Portland - sans camera. Over the next two weeks we will be releasing several videos that will be available from a few outlets: VirginiaWineTV YouTube Channel, Wine Bloggers Conference YouTube Channel, and VirginiaWineTV Podcast. The Loudoun County pre-tour will also be available at Visit Loudoun, who's financial assistance made the filming of that segment possible. Anyone we tasted the wonderful wines from Breaux Vineyards, Tarara Winery, Boxwood Vineyards, and Chrysalis Vineyards, Catoctin Creek Vineyards, and 8 Chains North Winery understand that this region produces exceptional wines. One of the coolest sessions at the 2011 Wine Bloggers Conference was the Live Wine Blogging. Two sessions were held, one for whites and roses; the other for reds. The basic idea is that each winery has five minutes to pour and market their wines to a table of about seven participants. During that five minutes, each participant blogs or tweets their thoughts on the wine, presentation, packaging - whatever comes to mind. Once the five minutes have past, the winery rep moves to the next table to repeat the process. Organized chaos - and tons of fun. During these sessions I was able to capture a partial twitter feed and used one tweet from each participant to create the videos below. Music for the video is provided by Jason Webley and The Reverend Peyton's Big Damn Band. Just stirring from dehydration and a hangover Sunday morning after four days (including Loudoun County pre-tour) of the 2011 Wine Bloggers Conference and am overwhelmed by all the out of state bloggers who made the effort to travel to Charlottesville. Pretty damn awesome. Plus all the Virginia wine folks who shared their stories and wines to us. But it just wasn't Virginia wine, particularly in the after parties. There was Rioja, Chilian wine, Saperavi from the Republic of Georgia, Ohio Reisling, Texas Viognier, Missouri Vignoles, Rodney Strong single vineyard Cab, Austrian Blaufrankish (and Virginia Blaufrankish), Frontenec Gris from Vermont, Malbec from New Zealand, and plenty of Croatian Plavac Mali. The point is, there is a wonderful world of wine available out there. Think outside the box and try different varieties or even familiar wines, but from other regions. Cheers and thanks to all the attendees for sharing their experiences. WBC11 was way too cool. After selling-out 2010’s inaugural Kyle’s Brew Fest, Kyle Hollingsworth, keyboardist of The String Cheese Incident, will host his second annual charity beer festival and concert on Saturday, July 23, benefiting Conscious Alliance. For year two the festival moves to a new location Boulder Beer Company in Boulder, CO. Kyle’s 2011 Brew Fest will be bigger and better, featuring over 25 breweries, over 50 craft beers (including Kyle’s brand new brew Hoopla Pale Ale) and an extra hour on a Saturday afternoon to enjoy it all! 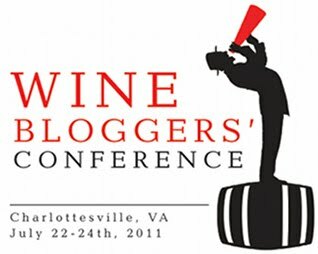 One of the many sessions that we are looking forward to at the 2011 Wine Bloggers Conference is the Friday Breakout Session: Drinking Local. The session is moderated by Frank Morgan of Drink What You Like - a Virginia based wine blog. The panelists consist of Dave McIntyre, wine writer for the Washington Post and founding member of DrinkLocalWine.com; Lenn Thompson, founder of New York Cork Report; and Rémy Charest, blogger at The Wine Case in Canada. The topic is the virtues and challenges of drinking local - an issue close to our hearts. I love local wine; and not only the wine but the personalities, the stories, the trips to wine country. I loved hearing the story how Steve and Shannon Mackey started Notaviva Vineyards. I can hear Jenni McCloud (Chrysalis Vineyards) repeat her passionate speech about Norton wine - a thousand times. I've been known to travel 125 for an evening concert at Veritas Vineyards. I loved seeing Jim Corcoran (Corcoran Vineyards) proudly show off their new Bourbon barrel aged Chambourcin or their Lemoncello based Petit Mensing. My son gets a kick of seeing the photo from Hiddencroft Vineyards where owner Clyde Housel is hosing him down after an accident. Memories. These experiences is what lead us to start the WineCompass.com directory and the WineCompass blog. A history, I'm sure, shared by most attendees to the conference. So naturally, we are advocates for promoting local wineries, especially through VirginiaWineTV.com and by participating in DrinkLocal.com activities. We all can agree on the virtues of local wineries: preserve open spaces, jobs, tourism, the wines..... Numerous reasons. As well as the locavore\locapour movement, which I follow to a certain degree, particularly when eloquently articulated by Jenni McCloud in our VirginiaWineTV video on Talking Norton and DLW with Jennifer McCloud. To paraphrase: "If you eat locally, its natural to also drink locally." Yet, I am not a complete convert to the Drink Local movement. Why? Price is one factor. Local wine is expensive, at least in Virginia. I would love to be able to budget a Virginia wine on a regular basis, but the average price is approximately $20-$25 a bottle (my best guess). I understand the economicsand the tourism influences that lead to higher prices. I just can't afford them on a regular basis. And from what I've seen, Maryland, North Carolina, and Pennsylvania are heading in the same direction. But my biggest complaint with the Drink Local movement, is that proponents are throwing out multiple definitions of drink local. I've heard it used in a sustainability context with the locavore movement that you should only drink locally crafted wines and these wines must be produced using 100% estate grown grapes. No exceptions; minimal footprint. What's up with that? That is way too draconian. And with this definition, forget about someone from Florida purchasing a Virginia wine and having it shipped. Winemakers would never think of following that maxim (I've heard about Jenni McCloud's wine cellar), why should consumers? Others have generously expanded this definition to say, "no the grapes can be sourced from anywhere within the state and yes, you can ship the wine to other states". Yet, I have a problem with that definition as well. Tarara Vineyard & Winery (Leesburg Virginia) produces an excellent NoVa series using grapes sourced from the Mountainview Vineyard in southwestern Virginia, over 200 miles away. Glades Pike Winery (Sommerset, Pennsylvania) produces a Norton wine from grapes grown at Chrysalis Vineyards (Middleburg, Virginia) - 170 miles and two states away. Tarara is approved, but Glades Pike is put on the naughty list. Why? Should we set distance boundaries to define a local wine? Who then, becomes the drink local policeman? What does Drink Local mean to you? I don't really have a preferred definition, because I drink anything, from anywhere - wherever the winery is located: Virginia, Maryland, New York, Texas, California, Oregon, Washington, Hungary, Austria, Croatia, Slovenia, Italy, Spain, Germany, France, Turkey.... And I don't really have a problem if a winery sources fruit from California; as long as the wine is labelled as such. Case in point, the Biltmore Estate Winery; if you care, just purchase their North Carolina wines. As I step off my soapbox, I look forward to this session. Maybe the panelists will attempt to define Drink Local, maybe not. But we all agree on one concept. Local wine is being produced in every state of this country and there are valid reasons to purchase locally. So, get out there and try some; you will enjoy the experience. The WineCompass.com directory can help you locate wineries in your state and if you want to visit a Virginia winery check out the Virginia Wine in My Pocket iPhone application. And attendees of the Wine Bloggers Conference will receive a free download of the app. Cheers. For those attending the 2011 Wine Bloggers Conference or for wine fans anywhere, there is a unique opportunity this Thursday July 14th (7 to 9 pm) to learn about Virginia's signature grape, Viognier. The Virginia Wine Board is hosting Viognier Night: A Virtual Tasting of Virginia Viogniers. See below for the participating wines and take a look at the tasting notes here. But most importantly, the winemakers themselves will be available to answer questions about their wines or the Virginia wine industry. Remember to use the #VaViognier hash tag. See you online. Join Virginia Winemakers for the first ever Virtual Tasting of Virginia Viogniers! Then grab some friends and food, and tune into the #VAWine #VaViognier conversation on Twitter! It is the perfect way to experience Virginia Viogniers in varying styles, from dry to off-dry, still and sparkling. Winemakers will tune in on Twitter Thursday, July 14th from 7-9pm to answer any and all questions pertaining to these Virginia Viogniers. Most of these Viogniers can be found at your local Kroger, specialty retailers, or ordered directly through the wineries. Also, please post pictures of your local VA Viognier tasting on Twitter during the event! We look forward to having you join us for this first ever Virtual Tasting of Virginia Viogniers! One of the sessions at the 2011 Wine Bloggers Conference that we are really looking forward to is the The Other 46 tasting Friday night. Yes, no California, Oregon, Washington, or New York wines allowed. Instead, expect wines from Loudoun County Virginia (courtesy of Breaux Vineyards and Tarara Winery); Maryland, Missouri, Texas, Indiana, and Ohio. For a refresher course on why grape growing is so difficult in the East Coast and Midwest, check out A History of Wine in America, Volume 1: From the Beginnings to Prohibition . This book also describes the painful ordeal Thomas Jefferson and Philip Mazzei experienced when attempting to sustain grapes in Albemarle County. Good background for the conference in general and the Monticello dinner. Back to The Other 46 tasting, what wines should you expect? There better be some Viognier from Loudoun County because Texas Viognier will be in the house. Vintage Texas is also expected to pour some Blanc Du Bois, Tempranillo, and Roussanne. From Breaux and Tarara, we also hope to be tasting some Merlot and Long Bomb respectively. The Indiana Wine Grape Council will be pouring plenty of Traminette (that state's signature grape) whereas the Missouri Wine and Grape Board: I would guess Vignoles and Norton. This would be an interesting time to compare Midwestern Norton and native Virginia Norton. Jenni, where are you? Now, Ohio has moved beyond Catawba, but it would be very interesting to sample some sparkling Catawba. Or perhaps some Lemberger or Riesling. We shall see what Southern Wine Trails decides to pour. That leaves Maryland, and the Maryland Wineries Association is still determining which wines to showcase. There's no doubt that its time to unveil the Free State as the next producer of quality vinifera wines - just sample those from Black Ankle Vineyards, or Sugarloaf Mountain Vineyard, or some Sangiovese from Fiore Winery. Virginia's northern neighbor is moving closer to the Commonwealth. For now, that's the latest. Can't believe North Carolina or Pennsylvania or even Michigan or Colorado wines will not be presented. That's a real shame. For any impromptu tastings, we are coming prepared with a few wines from our assorted collection of Other 46 wines. Looking forward to a fun and rewarding weekend. Thanks #wbc11. We've been neglecting our northern brethren for a while so we scheduled a trip near Frederick to restock our mead collection. Yes, we are fans of honey wine and decided to sample the wines from Orchid Cellar Winery, located a little northeast of Frederick in Middletown. The winery has been operating for 4 years, the last two in the current location. The honey is sourced from local and regional apiarists accentuated by their own bees. The Wilk's family base their mead on Eastern European\Polish recipes in honor of their heritage. And what's fascinating about these meads, is the diversity in styles. The Ambrosia is a Pyment made from honey and Chardonnay grapes; the Blacksmith a Melomel made from honey, raspberries, blackberries, and blueberries. I'd never heard o f or tasted a Capsicumel which is mead made with chili peppers. And Orchid Cellar offers two: the Hunter and the Big Game Hunter which has three times the peppers. The Hunter was balanced between heat, spice, and sweetness and is surprisingly, their best cellar. The other, too much heat for me. My favorites were two traditional Metheglin (honey and spices): the Knight and the Monk, The former is based on recipes attributed to Capuchin monks; the latter from a recipe attributed to Bernardine monks and includes spices and rose petals. Both were slightly sweet, and full of flavor, nicely balanced between the honey and spice. In the future the winery will start offering traditional grape wine, but for me - I'm content with the honey wine. From Orchid Cella r Winery, we migrated a little closer to home in order to hear some local music at Sugarloaf Mountain Vineyard. This winery offers live music on a constant basis and we had neglected them for too long. On this day, Rob Thorworth was entertaining an overflowed patio of wine drinkers with a collection of originals and eclectic covers. We rushed to sit down when hearing Little Feat's Spanish Moon, followed by Lyle Lovett, The Beatles, and Warren Zevon. Good music paired with a merlot based Rose. Nice. Two videos are available at the MyJoogTV YouTube channel. Cheers.